Bluetooth Rechargeable Outdoor LED Flood Light (T9724R) (100-3000 Lumens adjustable). A versatile, high powered and rechargeable LED flood light, with a handy App to control the light from your mobile phone: 24 High Power SMD LEDs; beam angle 360° with 3 adjustable light panels; mains charger; USB output port for charging devices; button and Bluetooth switch control; battery charge indicator. Special offer price – RRP £70.00 ex VAT (€81.19). Rechargeable LED Clamp Flood Light (T9715R) (1300 Lumens). 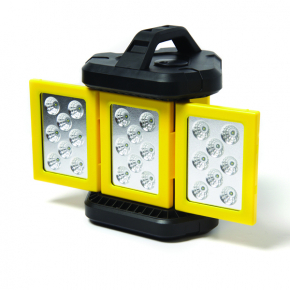 A high power rechargeable flood light, featuring a strong clamp system and 360° swivel head; beam angle 120°; battery charge indicator; battery life up to 7.5h; mains charger. Special offer price – RRP £33.00 ex VAT (€38.27). Deburring Tool (T2280). Ideal for fast and effective burr removal and made from special hardened steel with a hardness of HRC 64. Special offer price – RRP £5.00 ex VAT (€5.79). 28 Piece Pocket Socket Set ¼” drive (T4654). A high quality CR-V Sockets and Bits Set contained in a tough compact storage case. Featuring anti nut rounding 12 point sockets; 13 x sockets size 4-14mm; 25mm bit adapter; 50mm extension bar; 72 teeth ratchet handle; 12 x 25mm bits (PH: 1,2,3; PZ: 1,2,3; TX 15,20,25; HEX: 4,5,6mm). Special offer price – RRP £15.75 ex VAT (€18.26).